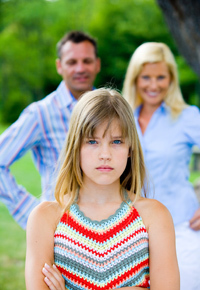 The reality of divorce in the 21st century has forced many adolescents into awkward stepparent situations. While some teenagers accept their stepparents’ role readily and with little drama, other teens are not so quick to adjust. To ensure that your family makes the transition smoothly, follow the tips below. A new relationship between a parent and potential spouse should not be kept secret from the children. If the relationship looks like it is moving seriously towards marriage, then it’s important to let your children know so that the move does not come as a surprise. Consider planning a date night for the children to meet the new person in a low key and fun environment. Allow the new person and children to develop a relationship organically before incorporating the stepparent into your family. A healthy relationship will only grow through open communication and trust, and things that probably won’t develop easily if you keep your teens in the dark about your plans to move forward with your relationship. Children, especially teenagers, feel their emotions with little filter for expression. Wild tantrums and willfully mean behavior should not be tolerated, but it’s important to delve deeper into these reactions. Do not ignore the emotions behind these outbursts, as ignoring the underlying causes will do little to solve the problem. Instead, diligently express to your teen that you want to understand their emotions and help in any way you can as you move towards building a future with your children and your new spouse. Make it clear to your teenager that this marriage is a positive step for you and the entire family. Speak to them as an adult by laying out the reasons you are drawn to this person, and (again, treating them like the young adults they are) give them a chance to offer their input. You are not asking their approval for your actions; rather, this is to help each of you understand each other’s actions. Keep in mind that there will be good days and bad days and that some changes will be tough for your teen. However, families that communicate are in a much better position to cope with any issues that might arise than families with parents who “lay down the law” and teens who act out accordingly. Adding a new person to a family is always tricky. The most important thing to remember is communication. Never stop reaffirming your teenager and their place in your life. Take time to do the normal things you would with them and try not to disrupt their schedule more then you have to. Your love and devotion will translate into a happier healthy family through communication and respect.